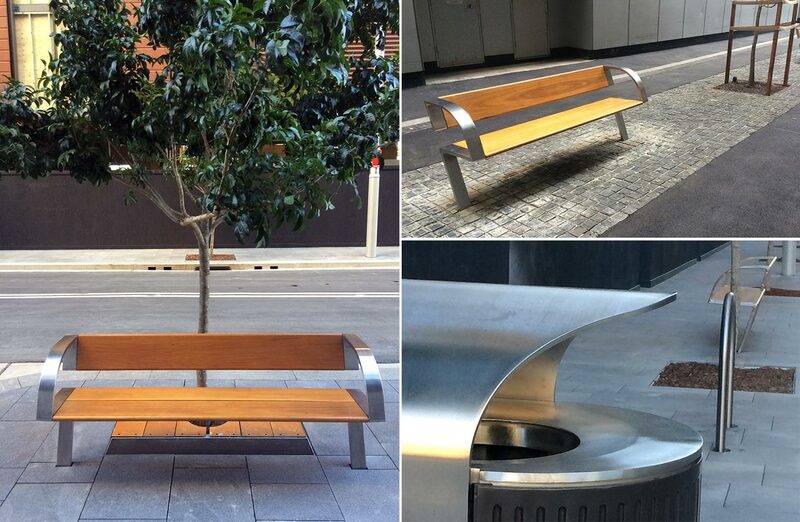 The roll out of the City of Sydney public domain furniture suite has begun across the city with Barangaroo, Green Square and Alberta Street the first to have elements installed. The range includes seating, garbage bins, bollards, pedestrian light poles, dining barrier, a bubbler, tree guards, signage and picnic table elements . It was inspired by the industrial elements common throughout the inner city, and uses the folded metal plate as the genesis of form for each of the elements. The new street furniture is made in Australia by ABUD (Australian Built Urban Design), a locally owned and operated company from Kurnell, New South Wales with more than 75 years of experience in crafting public domain objects.